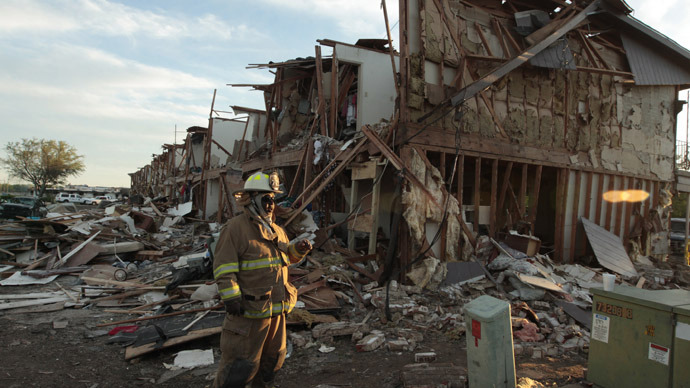 The huge explosion that tore apart the West Fertilizer plant in Texas was adjacent to homes, a school and other town structures. As investigative reporter David Lindorff tells RT, today in the US corporate interests often trump genuine public concern. The same fertilizer plant that resulted in the confirmed deaths of at least 14 residents of West, Texas and injured hundreds more, was fined in 2006 for not having an adequate risk-management plan. That same year the West Fertilizer plant reported it posed ‘no risk’ of fire. RT:So, just how tightly enforced are these kind of regulations? David Lindorff: Not tightly. I’ve written for years for a magazine called Treasury & Risk that looks at these kinds of things, and I’ve covered over and over how companies get cited for not having these risk plans in place. And they get a small fine, and then they don’t do anything. They maybe go through the motions of having a risk plan, but the reality is that it makes absolutely no sense to even have a plant like this in a town. But all over, especially in the West where you’ve got fertilizer plants, oil refineries and so on, they’re right in the middle of these small towns, with houses all around them, and schools and nursing homes. RT:While the factory produced large quantities of explosive materials, such as the ammonium nitrate suspected of causing Wednesday’s catastrophic event, there were both a school and houses very close to the site. As many are left wondering now, just what sort of rules are in place to dictate where potentially hazardous industry is located in relation to populated areas? DL: The problem is that in the United States the entire regulatory apparatus that oversees these kinds of safety issues has been captured by industry, by corporations, through their control of the politicians through their campaign contributions. So, for example, OSHA (Occupational Safety and Health Administration) doesn’t do any inspections because they don’t have any money -- they don’t even have a director because the Republicans don’t allow them to get one. And, the same with the EPA (Environmental Protection Agency), they are preventing the naming of a new director for the EPA, which also cited the plant. So, you simply don’t get any regulations. And at the state or local level where these permits would be issued, as to whether a plant could even be built inside a town, the control over the regulators is even worse. So we essentially have a free-for-all in the United States for dangerous factories and producers of these kinds of explosive chemicals. They can build them anywhere they want -- right next to a hospital, a nursing home, a school, and there’s no controls at all. As many are already aware, West’s tragic accident is not the first such incident in Texas - a similar incident decades ago killed hundreds. But what's the lesson for Texas authorities here? It’s really not a lesson for the authorities, it’s a lesson for the American people that we’ve allowed our country to be taken over by corporate interests that simply trample over any kind of regulation. And until the American people say no more, our representatives are supposed to be looking over our interests not corporate interests, this is just going to be a story that gets repeated and repeated,” according to Lindorff. RT:Considering both the loss of life and the property destroyed, will the company face penalties, or will any party be brought to account? Well, first of all you’ll never see any criminal charges brought against this company, that doesn’t happen here. That’s ruled out. What you may see is some kind of a fine against the company for some kind of violation, but it’ll be a token thing, and they’ll get insurance and rebuild the plant, and I’m sure that they’ll rebuild it right back in the place where it is now. That’s the way it works.